Dr. Lauren Lek congratulates a graduating student at Our Lady of Peace. Today, education is as challenged as it has ever been to prepare students for a rapidly changing, globally competitive world. The jobs of the future are shifting at the same rate of change as all other things, and the speed of change only seems to be increasing. 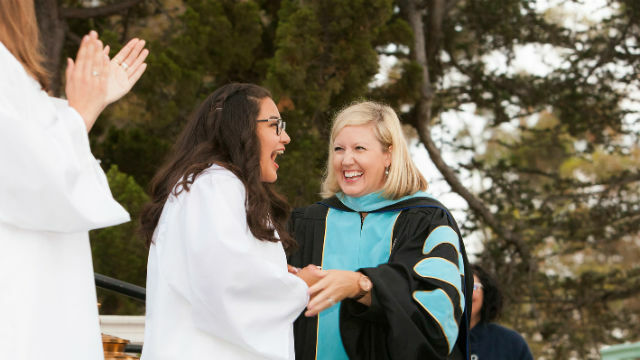 As the first lay leader of the oldest and only remaining all-girls high school in San Diego, I recognize that our girls will be required to enter careers that demand problem solving, critical thinking, inventive reasoning, effective communication, and a moral compass to guide them. Rigor and collegiate preparation today looks different for our girls then it did even twenty years ago. Memorization has become the lowest denominator for success, with synthesis and evaluation becoming the expectation. No longer do the instructional strategies once touted in a classroom, having primarily originated in a factory model of instruction, work to help students master these highly complex thinking skills. Guided by research from the top institutions along with best practices in all girls’ education, the Academy of Our Lady of Peace is pushing boundaries to challenge learners in new ways. Authentic learning based in critical thinking is hard, messy, and sometimes even discouraging. We also know the power of an emotional-social curriculum to simultaneously accompany the academic program in support of each student’s development. Teaching skills related to grit, resilience and a growth mindset have become essential alongside these higher order thinking skills. As teachers move to facilitate learning, our girls soar! Methodologies such as design thinking and project-based learning challenge students beyond the traditional “drill and kill” practices. In our new engineering course, adopted from Purdue University, the curriculum focuses on engineering projects in community service. Students are required to apply their engineering conceptual learning in real world applications that solve problems in our local society. The same is occurring in our highly competitive robotics team that last year won the rookie all star award and competed at the global level in Houston. Although many may ask the value of an all-girls education in 2018, there is no clearer example than the power of our all-girls robotics team at the global competition. Our young women were repeatedly asked if the boys built the robot for them. Even though our all-girls team programmed, tested, and successfully built “Debbie” (their robot) together, the question still exists. Not only does Our Lady of Peace offer students a place where they can expand their horizon, test their assumptions, build and create, the school offers an environment where collegial success is lauded, and the students champions one another’s accomplishments. Looking at this most recent class of 2018, the 185 Our Lady of Peace graduates were some of the most highly sought-after students at the top Ivy League and research universities around the world. Collectively these young women garnered more than $29 million in merit-based scholarships across 74 percent of the graduating class. Furthermore, 16 percent will be the first in their families to go to college, and more than 40 percent will be pursuing science, technology, engineering or mathematics majors in college. Part of the magic of our school is helping our young girls develop their passions, find their voices and be ready to take on, what could be to some, the seemingly insurmountable challenges in life. A wonderful example of that is the Valedictorian, Melissa Ahrens-Viquez ’18, who will be heading on to Yale University where she received a full scholarship. She will be studying environmental engineering and eventually plans to join Engineers Without Borders. One of her most meaningful high school experiences was when she traveled to Costa Rica to intern at a natural reserve and hydroponic farm whose focus is to establish sustainable farming practices that promote economic justice. This passion grew out of her experience in advanced-placement environmental science and her work monitoring the school’s five aeroponic vertical farming towers. Melissa is just one of many students who, as an Our Lady of Peace graduate, will be a leader in changing the trajectory of her community and ultimately the world! Our students today will be facing obstacles that in our lifetime as parents we have rarely seen. In a world where the once dominant industries are being pressed to redefine themselves in the oncoming Internet of everything, our precious girls will need to be courageous women and extraordinary scholars. They are the hope for our world! Dr. Lauren Lek is head of school at the Academy of Our Lady of Peace in University Heights.